About Us | What Hi-Fi? Our comprehensive tests help you buy the very best for your money, with our advice sections giving you step-by-step information on how to get even more from your music and movies. Everything is tested by our dedicated team of in-house reviewers in our custom-built test rooms. For 30+ years, the What Hi-Fi? 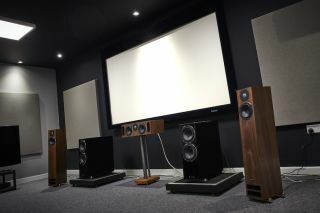 Awards have been the ‘Oscars’ of the hi-fi and home cinema industry, with a Product of the Year and Best Buys at a series of price points in every product category. The Awards results are announced online and in print immediately after a prestigious Awards ceremony in London. Subscribe now to our print or digital edition, or a combination of both. We have state-of-the-art testing facilities in London and Bath, where our world-renowned reviewers put more kit through its paces than any other brand. We can, and do, handle anything from the smallest portable speaker to the largest home cinema system. We’re the only brand in the UK to have a dedicated team of in-house reviewers delivering all of our reviews, all working in the same suite of acoustically treated listening rooms. This gives us complete control over how products are tested and the environment in which they are tested. Between us we have more than 100 years experience of reviewing, testing and writing about consumer electronics. The main hi-fi test room is used for all separates stereo components such as CD players, turntables, amplifiers and stereo speakers. We also use the Future photographic studio and in-house photographers, so all equipment is photographed for the magazine and website to the highest standards. All products are tested in comparison with rival products in the same price category. We have a warehouse full of kit, so even in a First Test a product will be reviewed in the context of other products in that sector of the market. All review verdicts are agreed upon by the team as a whole – not an individual reviewer. Each product will be listened to and/or viewed by several members of the test team, who will then discuss the final verdict before it appears in the magazine or on the website. This avoids any individual bias creeping in. No manufacturer or PR is ever shown a review prior to publication, and our advertising department never knows what the test verdicts are before the magazine is published or a review appears online. So you can rest assured that all What Hi-Fi? reviews are fair, honest and accurate and brought to you by the most experienced team in the business. What Hi-Fi? is a member of the Independent Press Standards Organisation (which regulates the UK’s magazine and newspaper industry). We abide by the Editors’ Code of Practice and are committed to upholding the highest standards of journalism. If you think that we have not met those standards and want to make a complaint please contact whathifi@futurenet.com. If we are unable to resolve your complaint, or if you would like more information about IPSO or the Editors’ Code, contact IPSO on 0300 123 2220 or visit www.ipso.co.uk. 'Promoted content' is paid for and provided by an advertiser but is content that we believe is relevant to and of interest to our readers, and is written in the style of What Hi-Fi? It is not written by the editorial team. 'Sponsored content' is commercially supported by a third-party sponsor but is written by our own editorial team and may not include sponsor sign-off on the content or a direct product message.